'Is Anyone Out There?' They're all gone. For a second time in memory, the world of ghosts falls silent... but that's about to change. It's time to take the fight across the Shroud, back to where it began... back to the Shadowlands. You have the means and abilities to make a difference, but beware. You'll need every trick in the book to survive this new battleground. Civil War In this terrible, lonely place where the wind has teeth and a howl to shrivel the soul, salvation awaits among ancient ruins and forgotten citadels. This is only the beginning of a new fight, one that will forever change this world and the next. A war of Spectres is brewing, and you are caught in the middle. Ditto on the wishes for this to be PoD. Can we please get this on PoD already? 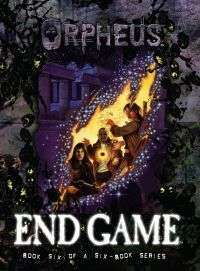 I really want all Orpheus books in print. Will this and the remaining PDF-only books ever be made print on demand?